This year again, we continue to showcase some of the best animated videos we found so we created this read for you with the best 8 animated videos of the first quarter 2019. The selection process is as always very difficult for us, and this time we worked hard to show you some of best among the bests where you can find names such as Disney, Mercedes Benz and other industry leaders. Also among these large players there are smaller studios that created brilliant animated video projects and commercials in this year. This time we made a mix with video projects such as logo animations, animated commercials, intros for broadcast as well as animated promo spots. We’ve also found some of the different styles for you, such as 2d animated video promos. We believe that they will enjoy you in visual cakes. Beautiful 3d logo animation project that showcase their skill at glance. If you inspect carefully the have show almost every aspect of the good 3d animated video such are character modeling, 3d animation, visual effects like smoke, fire and fluids etc. Every detail is perfectly mixed in so it is busy on screen and at the same time it flows nicely into viewer’s mind. Awesome motion graphics project for new music tv show in Taiwan by a JL Design. This highly detailed motion graphics project will leave you breathless. A lot of the details has been invested into transitions between the animated scenes. Whole intro is based around the claw marks and the Asian culture. Fast paced futuristic 3d animation advert for Formula E by The Mill. One of the pioneers in the creating of 3d animated videos for broadcast and big companies around the globe. A lot of speedy cuts showing the 3d model of a formula. We love details sucha are spark and smoke effects that going on around the scenes. Again this is a masterpiece by one and only The Mill. 3D animation masterpiece that brings us back to the time when we where youngsters. This 3d animated intro for a biggest kids tv channel – Disney Junior is just superb. Great 3d animated character moves, awesome camera cuts mixed with nicely lighted scene is what keeps you interested. We love the clay materials and rendering that spices this animation up. Impressive animated/motion graphics video advert by a leader in the automobile industry – Mercedes Benz. Beautiful mix of animated elements and live footage is what makes this video presentation remarkable. Center weighted scene cuts makes your eyes stuck onto the action titles that coming in between of graphic elements. 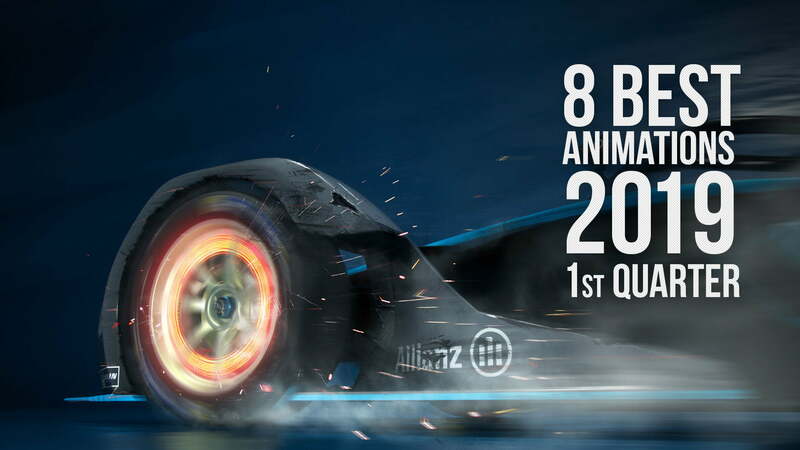 7th on the list of best animated video projects in the 2019. so far is this 3d logo animation video by a Ditroit Studio. Slick and stylish camera cuts plus beautiful marble shaders and lighting that adds to the atmosphere is what makes this project ends in our article among the others. Filmic color pallete is very nice and it adds to realism. And as a last in our today list is personal 3d animation video project by a Fanny Rollot – Paris, France. Here is what he said about this project: “Gummy Vapormax is a personal reinterpretation of Nike’s Vapormax Sneakers. This candy version, allowed us to play with shaders, dynamics, colors”. Beautifully 3d rendered playful gummy elements that make your mouth wattery. We hope that you enjoyed today’s presentation of the best 3d animated videos in 2019. so far and also that you have found a lot of inspiration for your future video projects. If we have a little helped in this, it is our great pleasure. In the meantime, you can take a look at our 3d animation projects that we have done recently.